Meanwhile, place the rotini pasta into a large pot of lightly salted, boiling water. Cook 8 to 10 minutes, until al dente. Drain and rinse with cool water to cool. 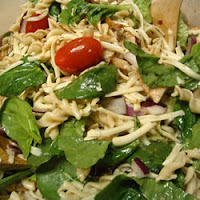 In a large bowl, mix together the cheese, onion, lettuce, and tomatoes. Toss with cooled chicken and pasta to serve.